You can read part 1 here.. to recap, I was stuck at 5-6 cm for 6 hours and really disappointed at the lack of progress. After 6 hours of no progress the doctor really pushed the pitocin. We discussed how my ultimate goal was to avoid a c-section and also that I knew I couldn’t do pitocin without an epidural. I know my limits. Breaking my water wasn’t even on the table anymore. I was upset about it for about 60 seconds and then we moved on. One great benefit to having a birth plan is that it caused Trig and I to talk about everything that could potentially happen and how we would move forward (if A then B, if B then C, etc). I agreed to the pitocin but wanted the epidural first. The epidural didn’t hurt at all going in and took maybe 5 minutes max to do. Then they started the pitocin as slowly as possible to avoid bambino reacting poorly. This was very important to me. 2 hours later with the epidural and pitocin and… nothing. The resident on call who kept bringing the bad news suggested they break my water to insert an internal contraction monitor so they could up the pitocin and see how well my uterus was contracting. They kept the fetal monitor on the outside. We talked about the positives and negatives of that and went for it. This was at 1 am. At 1:52 AM another resident came in because the monitor wasn’t picking up anything and I was in PAIN even with the epidural. I was working the contractions like crazy and they hurt even more than the ones I had before the epidural. I couldn’t believe the monitor wasn’t picking anything up. The resident pulled it out to re-insert it and found out that in 50 minutes I went to fully dilated, effaced, and +2 station… also known as COMPLETE. HURRAY! We couldn’t believe it happened so fast. They warned me that it takes first time moms an average of 2 hours of pushing and asked if I was ready to try. I replied that I was not sure as I’d rather wait until I felt more pressure. I was feeling some pressure but not like I was expecting. They suggested one trial push. I tried and they ran and grabbed a doctor because he was coming out so fast! Here’s where the story gets really good.. 4 contractions of pushing and he was OUT! We could see his hair on the first push and they set up a mirror so I could focus on the area to push. Pushing felt really good. After feeling like my pain had no purpose it finally did. I put my gym face on and focused the same way I would during the last set of a hard workout. The feeling was the same too- I was in pain but it was good pain. Hard to explain. In 15 minutes of pushing he was out and on my chest and I was crying and he was crying and we were such a happy family. I only needed one teeny tiny stitch and bambino had an Apgar score of 9/9. He was born at 2:18 AM on the first day of fall and first day of Libras! My ultimate goal was a vaginal delivery and I am so happy I was able to have that. We made the right decision trying for 6 hours to progress even though they started mentioning the P word after 4, and then we made the right decision to have the epidural/pitocin. I think that the hours of laboring standing up with no progress helped him move down and the pitocin helped me finally dilate the last few cm. The labor from start to finish was 22 hours, but the time flew. My recovery has been excellent and within a couple of hours I was showered and walking around just fine. I felt fantastic almost immediately and that shocked me. I thought I would feel exhausted and crummy and sore, but I had none of that. Bambino’s birth story is one I am so proud to share. We stayed focus, we were flexible, and both bambino and I handled it very well. Thank you for letting me share it with you. And for the pregnant ladies- labor is unpredictable and hard work, but it’s true that you can do it if 1. you focus on one contraction at a time and 2. you stay flexible and know your options. Discuss every possible scenario with your partner and know what you will do in each situation. PS- On Babycenter today I revisit my checklist and discuss what I am happy I had and what never left my bag. You look absolutely beautiful. What a great moment for you, your husband, and son! I am sure “life as you know it” is tough right now, but it will all be worth it in the end. Enjoy! What a beautiful birth story- I’m so happy it turned out to be a good experience for you! I ended up deviating from my ‘plan’ too (and with only 4 contractions of pushing too :)) and it ended up being a great decision. Cheers to healthy, happy babies!!! Such a great story!!! Thank you for sharing! Beautiful birthday story! My older sister had her 2nd baby on Wednesday and her labor didn’t go as expected! love that picture of you and bambino – you look so happy and content. congratulations again! i think the biggest thing (besides the healthy sweet baby boy and happy healthy mama) is that you guys were prepared for anything and were flexible with it. so proud of you guys – all 3! Thank you so much for sharing! I am 8 days from my due date and have been loving all the babies coming into the blog world the last couple of weeks because I get to read beautiful birth stories like yours. Gets me amped up for my own. You look GREAT! That is an awesome story, glad it all was soooo positive! Hoping to have a positive birth experience too.. My due date is tomorrow! i am so happy for you guys and glad you made it through so easily. what a beautiful story! and he is just too precious. Congrats! Thank you for sharing your birth story and being so honest. I’m trying not to get too hung up on my birth plan because you truly never know what will happen. Great birth story, I too hope to deliver natural but our story reminds me that it is ok to deviate from the plan. Your son is gorgeous, congrats! Congrats! I’m so glad to hear of someone using pitocin and an epidural that didn’t end in a c section. Gives me hope! Congrats! I am glad it all went so well! I can really see the joy on your face in that photo! 😀 Congrats on such a beautiful baby! It sounds like you approached the labor process reasonably and did what worked best for you (and Bambino! ), and I give you tons of credit for that. So proud and happy for you! Flexibility is key! im wondering why you had to have a epidural when you got pitocin? i was induced with pitocin but didnt have an epidural. i was very lucky to have a very short and easy labor and birth of my son. @ashley, I chose to have an epidural with the pitocin as I didn’t feel that I would be able to handle my labor with pitocin with no pain relief. I realize that many people do it, but I know myself and my body and felt I would not. I couldn’t have read this at a better time. I’m 31 weeks with our second child and, due to a low fluid, the doctor has already thrown around the “I” word, insisting that I won’t go past my due date. In my mind, pitocin = epidural = c section. I’m a big believer in natural childbirth when possible and was very, VERY upset about the potential of my doctor rushing this process along via induction, pitocin, etc. Your story served as a good reminder that you need to trust your doctor and yourself and do what’s best for that little person inside you. And sometimes you may just be surprised at the outcome. Thanks for your story! It’s actually very helpful. I too am planning a non-medicated birth with no epidural or pitocin. Apparently the key seems to be small amounts at a time rather than large doses. I am going to discuss this with my doctor that I need to be given time in trying to do it my self (as long as baby doesn’t become distressed) before the intervention of medication. Thanks again! Great story, thanks for sharing. I am booked in for a ceaser at the end of the month. I don’t hv much choice, but I am chilled and happy to do what will be in the best interest for the baby – that is what is most important afterall. Good luck for the 1st few wks, ill be back to visit ur blog to see how it is all going. That picture captures so much emotion – Sabrina, you are a beautiful Momma! YAY LIBRAS! We like things balanced and harmonious! Also, I can’t imagine them holding a mirror and looking at . . . .THAT. I guess when the time comes, maybe I won’t be so squeamish. Even with the epidural, the pitocin makes contractions a lot more painful than it would be without any medication. Thank you for sharing your story. You were very brave it I found it very encouraging. I’m due any day now and you’ve helped me realize that even a 22 hour labor can still be a good thing. @Lynn, And in fact I think the 22 hours caused him to move so far down that pushing was easy and short. Staying at 6 cm for hours standing up did have one benefit- he moved down a ton! @RhodeyGirlTests, I never thought of it that way! Thanks for saying that! I had 26 hours of labor, but only 5 minutes of pushing, so that totally makes sense to me. So glad you got the vaginal delivery you were hoping for, that you’re recovering well, and (as I see others have said) the lucky ONE stitch! Loved reading this. I went thru 2 labors with my 2 sisters (not my own) and they had a hard labor. One of my sisters crashed (I don’t know the medical term for it) after giving birth and all the nurses came to help and she got shots all over her body to stop the bleeding. I hope in the future when I have my first child, that I will hav an easy delivery. You wrote your journey so well, I felt like I was there too, lol. Congrats and what a beautiful baby!! I too was disappointed with my birth experience a little bit because I was forced into an induction due to my daughter’s abdominal circumference on u/s. They let me go the full 40 weeks but I was admitted the day before my due date for induction. I had two rounds of cervidil which didn’t work, and two rounds of pitocin. I finally went into labor on day 3 of my hospital admission. The majority of my contractions I didn’t even feel as I was given an epidual at 2cm. My labor lasted 13 hours and was pretty uneventful as I didn’t feel much. My nurse checked me and I was fully dialated and so she too said we should do a “practice push” well, that practice was the real thing and after 6 pushes my daughter came out!! Definitely not the horrifying, painful event that I expected…mnaybe next time i’ll forgo the epidual for a while so I can earn my woman badge of courage…lol!!! What a beautiful story!! I am so glad you shared it with us! You are so lucky to just have gotten one little stitch! 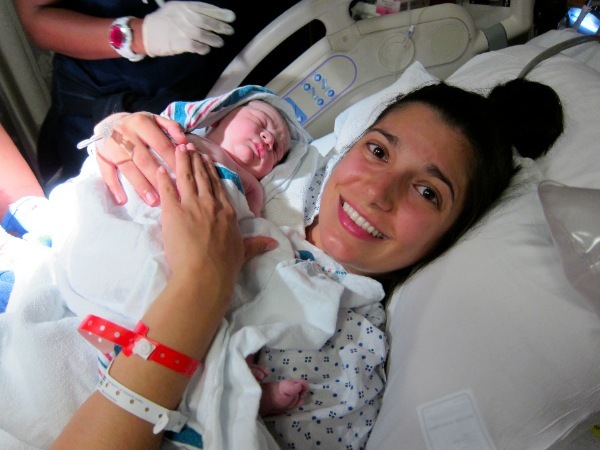 I went into labor at 3am, had my water broken at 9am…then things got extremely painful. I did not want to do an epi but after that I couldn’t handle the pain. By 11:30am I had an epidural and I agree…it’s NOTHING compared to what I was going through the 2 and a half hours before I asked for it. When I was pregnant the epidural scared me more than the labor. I started pushing at 4:20pm and Ella was born at 5:50pm. Being in labor with no progress was probably so frustrating. The checks were the worst when there is no progress. I remember how excited I was when it was finally time to push! You are also lucky about the 15 minute pushing! Your little guy is so beautiful I bet you just stare at him all day long!!! Congrats again on your bundle of joy, he’s beautiful! I LOVE the picture of you with the baby-your happiness is so clear in the picture! Such a beautiful story! Thank you for sharing! I love that you were so prepared and flexible. I plan to be the same way with my own upcoming birth. Congrats on the beautiful baby and on your new family! Sabrina, I am so happy for you and your family. Thank you for sharing your story and sharing your responsible advice. You make the whole thing less scary! I hope you don’t think it is tooo weird, but I looked up Raffi’s astrological chart to make sure he is a Libra. The cusps can be tricky because the sun moves into a sign at a different time each year, that is why you see some newspapers with differing start days for each sign. Anyway, it turns out he is a Virgo. (He was born the 23–correct?) Because he was born so early in the morning, the sun was still in Virgo. Either way, when you are born on a cusp, you can take on traits of both signs. Some astrologers believe that when you are definitely at the end of a sign, as he is, you are even more characteristic of that sign. I looked up some other tidbits from his chart and I am happy to share them with you, if you’d like! Can I tell you that he has Mars really close to his ascendent–I am not surprised he does not like to sleep! A placement like that tends to make you very active! Please contact me if you’d like to know more. And for the record, I believe in free will astrology, that is, we all have certain tendencies that we are born with, but it doesn’t determine how we live our lives. @Marge, Thanks! I’d love to know more! There are lots of things to say, but I will give you the standouts. Also bear in mind, that some of these characteristics do not show up until later in his life and that this is a map of sorts not his memoirs. It is an indication of what his tendencies may be, but not who he necessarily may become. I will assume you know a little bit about Virgos, who generally have understated demeanors, analytical, cerebral, perfectionists, the type-As of the zodiac. They dont all turn out to be that way, and it is unclear whether Raffi will be a type A sort. My guess is that he will in some aspects, like his work and perhaps how he presents himself. WIth A Leo rising, he will have a more magnetic presence, and draw more attention to himself. They have a flair for drama too. I like to think of Madonna as the ultimate Leo, regal and commanding. But he also has a moon in cancer, which highlights a softer, more giving and emotional side. Furthermore, his moon is placed in an part of the chart that shows his sensitive and vulnerable side, but he may like to bury it. In fact, it seems like he truly connected with you while you were pregnant. He will probably always have a deep seated emotional connection with you. I say deep seated, because he may never be fully conscious of the feelings you passed onto him. One of the highlights of his chart is his ability for language. If you plan on teaching him languages, he should be great at it. He has one planet, Saturn, that may pose somewhat of a challenge, but I think it may mean he could talk a little later than you’d like, but I know he will be strong with his speaking in general. I know all parents like to think that their child is smart, I think he will be, with a sun in the third house. He may also be a good networker. He will be a dedicated worker with a rigorous work ethic as pluto is in the sixth house. (At times, he may get too much into his work.) He would seem to be a good analyst in whatever field he chooses. If he wants to be famous, he has two things in his chart that point positively to this, jupiter at the top of his chart is a great placement. This planet is generally a great planet to take a lead in your life and it will bestow him with blessings. He will have a fantastic public image and he will always have luck in his career. So odd to say, but I would recommend though that he not become a surgeon and if he works in finance, he should not be in charge of final bank decisions. He could very well work in the field and he may be drawn to it in fact, but he should be an analyst rather than an executor of sorts, if that makes sense. He may like working for himself. One tip: he has mars in a location (twelfth house)that I mentioned will make him very energetic. He also may get the sense that he shouldn’t express anger. If you find him repressing his anger, make sure he has another outlet for it. Repressed anger is never good. It may sound unrelated, astrology has weird polarities, but he may find working towards those in need to be rewarding. Doing charity work may be a part of the solution. He also may enjoy traveling and foreign languages as an activity of sorts. Mars is positively aspected to his Sun and Uranus, so I wouldn’t worry much about, just make sure he uses the outlet. Another aspect in his chart (sun opposite Uranus) point to his uniqueness. He will generally think and mostly cherish the fact that he has a personality like no body else. It can also make him a little stubborn and not likely to do what he’s told, if he’s not on board. In fact, it is another indication that ultimately, he may feel most like himself if he has a career where he works for himself. Hope that helps! Ask me any questions too. Tell me if anything already sounds off or accurate. I am always curious! I’m confused I thought the baby was a girl though?